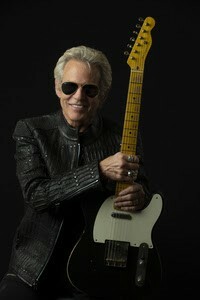 Legendary singer-songwriter, Rock and Roll Hall of Famer, best-selling author, and former guitarist of the Eagles, and true American rock and roll guitar hero DON FELDER is bringing more of his timeless music to adoring fans not only in America, but worldwide with today’s release of his second solo album, AMERICAN ROCK ‘N’ ROLL, on BMG. Fans can pick up the album on all digital formats here. With this highly anticipated new album, he’s very much looking forward to building upon his rich legacy in 2019 as one of the most innovative riff-generating songwriters of the modern rock era while continuing his growth as a featured touring and recording solo artist. AMERICAN ROCK ’N’ ROLL covers the gamut of the man’s artistic talents, consisting of 11 high-energy rockers mixed with touching, thoughtful ballads. From the state of the guitar-rock union salute to “American Rock ‘N’ Roll” to the funky crunch of “Hearts on Fire” to the fierce, unrelenting declaration of “Rock You” to the mutual heartfelt honesty of “Falling in Love” and “You’re My World,” DON FELDER has once again tapped into the current music zeitgeist to emerge with an album that represents the peak of his creative prowess. The album also boasts an impressive guest list of contributors who comprise a veritable who’s who of modern rock music, including Sammy Hagar (vocals on “Rock You”), Slash (a wicked guitar solo on the title track), Richie Sambora and Orianthi (dual guitar soloists on “Limelight”), Peter Frampton (Telecaster-blasting and background vocals on “The Way Things Have to Be”), Joe Satriani (a blistering, lightning-fast solo on “Rock You”), Mick Fleetwood and Chad Smith (trading off drumming duties on the title track), Bob Weir (background vocals on “Rock You”), David Paich (keyboards on “Hearts on Fire,” piano on “The Way Things Have to Be”), Steve Porcaro (keyboards on “Falling in Love”), Alex Lifeson (acoustic and electric guitar accents on “Charmed”), and many, many more. AMERICAN ROCK ’N’ ROLL is the follow-up to FELDER’s debut solo album, ROAD TO FOREVER which was released October 9, 2012 and debuted on Billboard’s “Heatseekers” chart at #27. “Girls In Black,” the album’s first single, reached the Top 30 on the Mediabase Rock chart, while “Wash Away” reached #4 on the Mediabase Classic Rock chart. It was co-written by FELDER and Styx’s Tommy Shaw, which also features Shaw’s signature vocal sound. Not only is FELDER a proud, longstanding member of the Rock and Roll Hall of Fame, having been inducted with the Eagles back in 1998, he was also inaugurated into the Musicians Hall of Fame and Museum in Nashville in 2016 and the Florida Artists Hall of Fame in 2017. Fact is, FELDER spent 27 years with the Eagles, who own the fine distinction of recording the top-selling album of all time–THEIR GREATEST HITS (1971-1975), which has sold over 38 million copies (and counting). “I’m blessed enough to have contributed to and been a part of a very talented mixture of voices, writing, guitar parts, and production. I’m very proud of that,” he says of the group. Meanwhile, his legendary double-neck Les Paul guitar is on display as part of the “Play It Loud: Instruments of Rock & Roll,” exhibit presented by New York’s Metropolitan Museum of Art and the Rock and Roll Hall of Fame which opens April 8 and closes October 1. FELDER was in attendance along with Jimmy Page, Steve Miller, and Tina Weymouth to celebrate the opening of the vast collection of some of Rock’s most celebrated instruments, including Jimi Hendrix’s guitar that he played at Woodstock and Ringo Starr’s drum kit that he played on “The Ed Sullivan Show.” It’s the first major exhibition in an art museum dedicated entirely to the iconic instruments of Rock & Roll. Through more than 130 instruments dating from 1939 to 2017—played by artists such as Chuck Berry, Eric Clapton, Sheryl Crow, Bob Dylan, Don Felder, Kim Gordon, Jimi Hendrix, James Hetfield, Wanda Jackson, Joan Jett, Lady Gaga, Steve Miller, Joni Mitchell, Jimmy Page, Kate Pierson, Elvis Presley, Prince, Keith Richards, Patti Smith, Bruce Springsteen, Ringo Starr, Eddie Van Halen, Stevie Ray Vaughan, St. Vincent, Tina Weymouth, Nancy Wilson, and others—“Play It Loud: Instruments of Rock & Roll” will explore one of the most influential artistic movements of the 20th century and the objects that made the music possible.